Yeehaw, I have been busy this last week! I am knee-deep in thesis and internship goodness. The good part is that I am enjoying it, a lot! The bad part … I lost track of the days and realized it has been a Hot Minute since I posted! 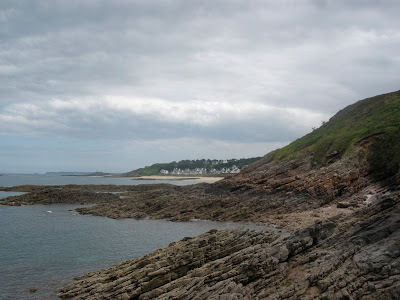 So in the spirit of it being Saturday, I will post about my lastest mini-vacation I took a few weeks back with Frenchie le Boyfriend to his family’s beach home in a town called ‘Erquy’ on the English Channel (or as the French call it ‘La Manche’). His grandmother, Frenchie la Grandma, spends her summers there and goes back to the big city, ‘Nantes’, the first weekend in September. We went to help her close up the house for the fall/winter and to go enjoy the last rays of summer sun! Here is the family beach house! Simply beautiful!! I love coming here! We took advantage of some beach time! This is a chapel built by fisherman for safety and prosperous fishing. 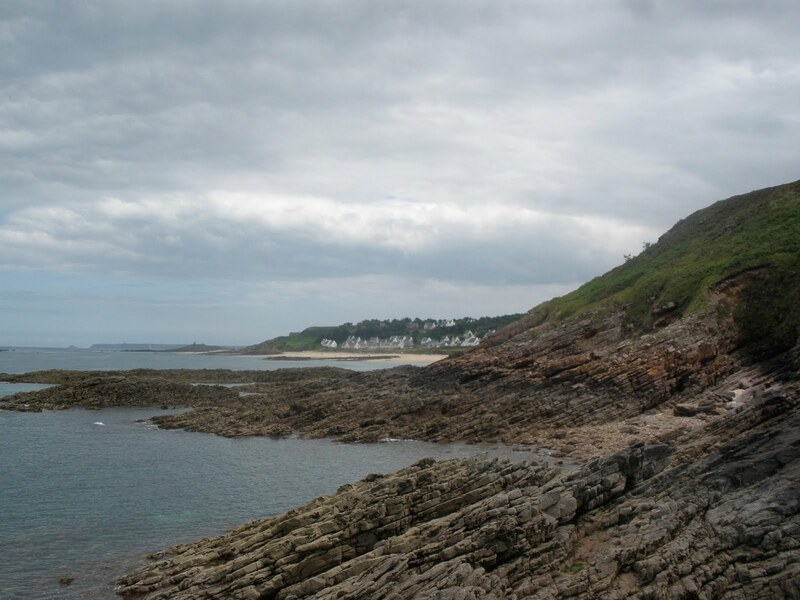 You can only visit the chapel when the tide is out, and you better not get caught when the tide comes in, or else you are sitting on an island for a while! One of the things I love most about coming here is ALL the yummy seafood Frenchie la Grandma cooks for us! And heaven help me when she feeds me lobster!! Lobster = Love! ATTACK OF THEY YUMMY SEAFOOD!! YEEHAW!!! The seafood here is super fresh! I mean it literally goes from the boats shown below, to the fish stand, maybe to the stove, and then my belly! Ohhhhhhhh I am mouthwatering! Isn’t my Frenchie tres, tres beau! 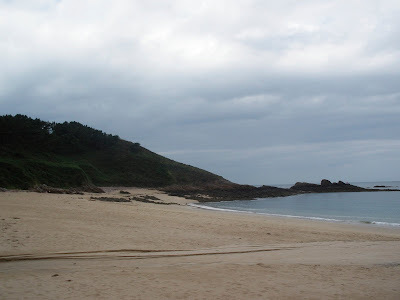 We usually stay local when we visit Erquy, but this time around, we decided to made a day trip with Frenchie La Mom and La Grandma to a beach city about 45 min away from Erquy called St. Malo. St. Malo is famous for its ‘pirate’ history and also for being a fortified port city. Yup … there is a humongous grey-granite stone rampart that surrounds the city center. It is incredible! All of the buildings inside are built with the same grey-granite stone used to build the rampart walls. Those are some dang sturdy buildings! At a few points in the ramparts, there are some doorways that open to the channel! Awesome right? The city inside the walls is sprinkled with shops, restaurants, cafes and bars. This photo is for my sister! That store has your name on it … literally! So back to the ‘pirate’ part of this city’s history! 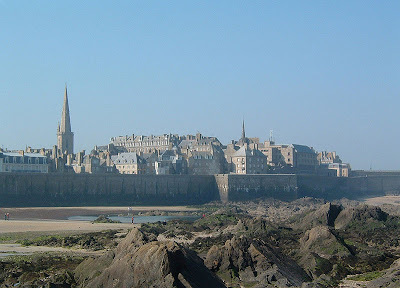 St. Malo was the home of french privateers/pirates! They were ‘allowed’ to conduct raids on shipping of any nation that was at war with France all under the name of the French Crown. Because they were doing this ‘legal pirating’ on behalf of the French Crown, they had certain ‘special treatments’ such as being treated as prisoners of war if they were captured by the enemy as oppposed to being left for dead like pirates. They were actually referred to as ‘corsairs’ (but that is just the french franco-fying the term privateer/pirate. In any case, a good chunk of this ‘legal-pirate’ money went back to the city (the other, back to these french privateers), which is how St. Malo became quite the affluent city. Pirate paraphernalia is in just about every store here! 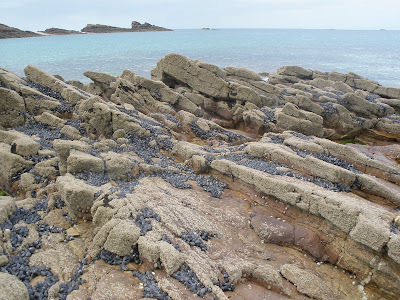 Also, St. Malo was the only French port city to receive rhum from the ocean trading routes. Go figure, it was the ‘legal pirate’ city. Hence the ‘rhum-only bar’ here. After some beach time and walking around me taking pictures like a dang tourist, lol, we decided it was about time to find a restaurant for dinner …. Did we want the Creperie (Crepe Restaurant) with convicts out front? Or the Creperie with witches and fairies covering the window? Or an old fashioned french bistro …. But then my eyes were immediately drawn to this place …. And largely in part to their sign …. “Les Buveurs de Lune” (The Drinkers of the Moon)! But seriously … how could you pass up a place that looked like this? We ended up asking for a seat on the terrasse! Great choice! I am going to give the ending away right now … this restaurant was a 100% success!! It was fabulous from start to finish, from wine to food, from deco to service! C’etait MAGNIFIQUE! The food and wine theme for this restaurant was bio/organic. They also serve as sort of a wine store … you buy the wine at retail price and then you either choose to drink it there with your meal or take it away and enjoy at home. One of the things that really impressed me was the service! Now in the US, servers are paid mostly by tips, so their tip should reflect their service. So yes, in US, servers work for tips. In Europe, as many of you know they do not. AND as some of you know the service is … well … generally not there. They do the minimum, but they are not there to entertain you or make you feel special. I mean, why should they? They get paid the same regardless. Well, at this restaurant … I felt like I was back in the US! The server was just a complete joy! He was extremely helpful, knowledgeable, caring and had a great sense of humor … I always love that in a server! For the second course, all four of us ordered the beef tenderloin with Indian spiced potatoes. YUMM! The beef was ‘melt in your mouth’ … it was organic beef … so the cows were hand fed and massaged daily with optional manicure/pedicures every other week. lol. Whatever … say what you want … but organic beef really does taste better. Next up was a cheese plate … I currently have a love/hate relationship with french cheese. I LOVE IT way too much that I have packed on a few ‘cheese pounds’ since living here in France. I blame the cheese for being too gosh darn good. I do not blame my lack of resisting temptation at all. The wine went beautifully with each course. It sang of beautiful aromas of dark fruits/berries with tannins like a huge bear hug and a perfect balance of acidity. I think I drank the better half of the bottle …. I was sad when it was over! The last course was dessert. If you know me, you know I DO NOT have a sweet tooth at all. I prefer an appetizer over dessert any day. I know, I know. I am not wired properly. I just like savory over sweet. Give me a break! But this time I ordered a Strawberry Panna Cotta …. it was not sweet at all … which was PERFECT for me … it was so good, I completely forgot to snap a photo of it! You can tell it was a good wine! I do have to say I find myself more and more pleased with the wine coming from the Languedoc-Roussillon region. They are really putting in some impressive investments/improvements there. I am The Ceci Sipper and I approve this wine region! I made a pit stop to the ladies room before leaving Les Buveurs de Lune … and guess what I saw!!!!! This resto does a ‘wine dating’ night. They match up single people based on their wine preferences!!!! WHAT AN AWESOME IDEA!!!! I know Frenchie Le Boyfriend and I are madly in love, but we both decided we would be curious to try this out, just to see what it is to be paired up by your wine preference! I am still flabbergasted with this! Does this exist where you are? All in all I give “Les Buveurs de Lune” two thumbs way up, 4 stars, 5 jalapenos, whatever the new rating system is! It was fabulous! 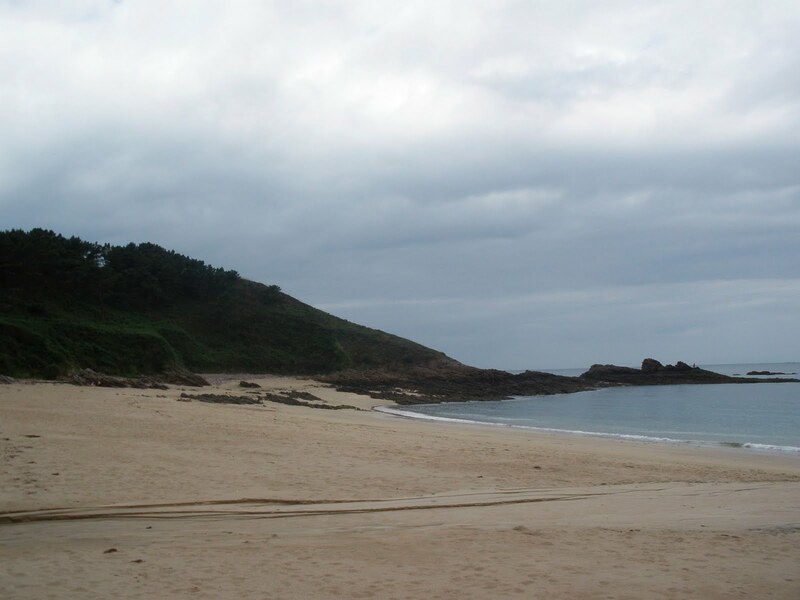 If you ever find yourself in St. Malo … YOU MUST GO HERE! Frenchie and I kissed Frenchie La Mom and La Grandma goodnight and we headed out for a little bit more wine before calling it a night. Hope y’all enjoyed the mini-vacation and hope you are having a fabulous Saturday! Next Next post: Wine Blogger Challenge – "Project Wine Blog"